While gin will never know the profuse showcasing that vodka has experienced in this last decade on the back bar, the spirit has seen a well deserved, much applauded and happily continued resurgence in the cocktail scene. Here are three unique labels you might consider. Each offers a beautiful blend competitive marketing and intrepid flavor for this generation. 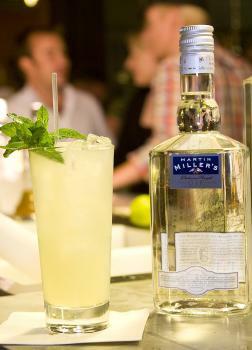 The 2008 results of the International Review of Spirits Competition - held by the Beverage Tasting Institute  rewarded Martin Millers Westbourne Strength London Dry Gin with a rating of 96 and a Platinum Medal. The lucky imbiber gets a hint of interesting botanicals including but not limited to violets, cucumber, herbal juniper and sweet citrus. Combine first four ingredients in a mixing glass, add ice and shake. Strain into a Collins glass over fresh ice and top with soda. In shaker, macerate basil, cucumber, mint and lime with ice. Splash with simple syrup and add No. 209 Gin. Shake and serve up. Aviation Gin is a small batch New Western Dry Gin, produced at the House Spirits Distillery in Portland, Oregon. 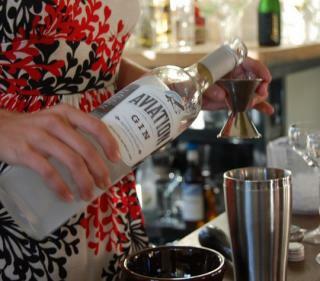 Aviation Gin, which takes its name from the classic Aviation Cocktail, evolved from a friendship struck in the summer of 2005, between Distillers Lee Medoff and Christian Krogstad and noted northwest Bartender Ryan Magarian. After meeting for the first time, the three realized that they all shared the same passion for delivering liquid flavor experience through their own individual mediums; Lee and Christian through spirits and Ryan though hand-crafted cocktails. Lee Medoff presides over a distillation process that begins with a maceration of botanicals that includes cardamom, lavender, coriander, anise seed, Indian Sarsaparilla, dried orange peel, and, of course, juniper, in 100% neutral rye grain spirit. Once the alcohol has soaked up all the flavor, the spirit is redistilled to arrive at the intensely flavored base product, which is then cut to 84 proof with de-ionized, de-mineralized, and desalinized water which affords these gentlemen the perfect blank canvas from which to paint the flavor portrait upon. This spirits complexity and mixability are not that surprising when the team dynamic behind it is considered.  says Co-owner Ryan Magarian. This means that Aviation distillers had a golden opportunity to gain firsthand insight on how it might work on the palate and in cocktails as the gin was being produced. Muddle ingredients and shake. Serve up with a red bell pepper slice and mint sprig garnish.